Happy Halloween! 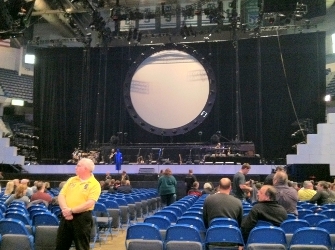 Continuing on with ‘The Wall Concert Series’, from Hartford, CT., 15th October at the XL center. Its a very compact venue with a concert seating capacity of 16,606. The venue was formally known as The Hartford Civic Center and was the former home of The Hartford Whalers. Pink Floyd played here back in 1987. This was my 6th time seeing the show. Not many recordings exist of this night and this is one of only two I know of. I explain a few things about the recording and I also provide three easy steps for getting that perfect recording. If you think you might be interested in recording concerts and for more information on equipment and what to do, please visit The Sound Professionals. A big thank you to RogFan for the recording. I saw this show – great seats in center of floor – not too far back. This was a validation show for Roger. In ’87 – he played this room early on his Radio KAOS tour and there were far too many empty seats that night. But that was not the case this night – the room was packed and the show was awesome !